Alejandro Jodorowsky, the Chilean-born director of movies such as El Topo (1970) and The Holy Mountain (1973), spent a large part of his life trying to make a movie out of Frank Herbert’s Dune. David Lynch’s 1984 version of Herbert’s novel — the movie that did get made — landed with a major thud. Director Frank Pavich’s Jodorowsky’s Dune takes an exhaustive look at the Dune that never found its way to the screen. 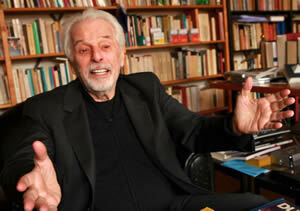 Pavich relies on interviews with the engaging Jodorowsky and with others who worked with him. Although Jodorowsky never got to make his movie, he did assemble a massive volume of storyboard illustrations — a wild series of images that Pavich uses liberally throughout the film. The suggestion: Jodorowsky’s Dune might have become one of the greatest achievements in cinema history. The 85-year-old Jodorwosky isn’t the least bit shy about contending that his movie would have been a landmark event — eccentric to the max. Jodorowsky proposed casting artist Salvador Dali and director Orson Welles in pivotal roles. One wonders whether, in the days prior to CGI, Jodorowsky really could have pulled off a visionary coup or whether, left to his own devices, he might have turned out the world’s most expensive cult movie. Whatever the case, it’s fascinating to hear Jodorowsky tell his story and to be handed the key to an alternative universe that never found its way into existence.